The American sentry I had been talking to had started forward. "Gosh! Are you hit?" People gathered round. There was the usual fuss—"Lift him up! Where’s he hit? Get his shirt open!" etc., etc. The American called for a knife to cut my shirt open. I knew that there was one in my pocket, but discovered that my right arm was paralyzed. In the hazy photo, a group of men and one woman pose for the camera behind a wall of sandbags, with their weapons at hand. They do not have the look of regular soldiers, and there are no uniforms. One individual stands literally head and shoulders above the rest. It is none other than George Orwell, or as he was known then, Eric Blair, his real name. The scene is the Spanish Civil War, and the photograph includes "the American" who came to Orwell’s aid when he was shot: Harry Milton. A small but interesting collection in the Hoover Institution Archives records Milton’s time in Spain, including his encounter with the future author of Nineteen Eighty-Four. 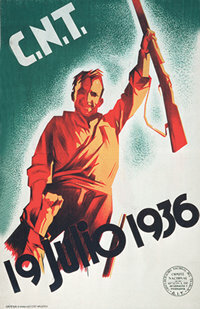 The Milton collection sheds light on Orwell’s political development in the crucible of Spain and underlines the role played by American volunteers in Spain who were not members of pro-Moscow Communist Parties and who chose to serve in formations other than the largely Comintern-recruited International Brigades, which received much more attention. 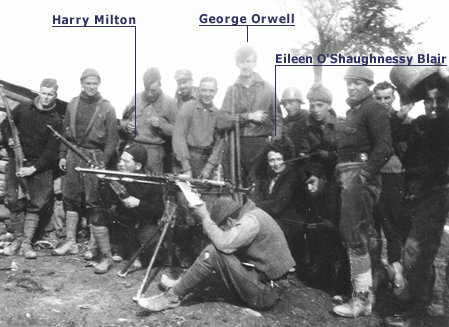 Group photo of the POUM militia, with George Orwell. Orwell’s wife, on a visit to the front at the time, is in the picture. Harry Milton is just behind the barrel of the machine gun, holding a rifle in his hands. Orwell’s vivid description of being wounded on the front lines near Huesca occurs near the end of his memoir of the Spanish Civil War, Homage to Catalonia. Many years later, Harry Milton, describing the incident to a reporter in California, attributed Orwell’s misfortune both to his height and to his somewhat reckless habit of looking over the top of their unit’s fortified position: "I heard the crisp sound of a high velocity shot and Orwell [toppled] over. He landed on his back." Milton recounts giving first aid, as Orwell waited to be taken to the hospital. In another article about the shooting, Milton claims only a modest role for himself: "I simply stopped the bleeding." Milton does, however, claim some credit for influencing Orwell’s political consciousness as it developed during his time in Spain. 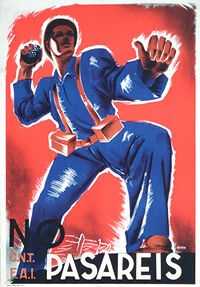 Spanish Civil War posters in the collection of the Hoover Institution Archives. The top two are from the anarchist movement, the CNT/FAI. The Catalan slogan at top reads "They shall not pass" ("they" being Franco’s forces). The date in the middle poster commemorates the day on which the Civil War and the ensuing social revolution began. 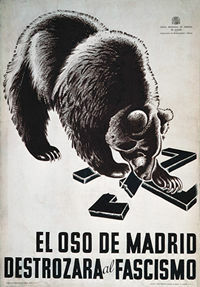 The bottom poster is from the defense of Madrid; the legend reads: "The Bear of Madrid Will Destroy Fascism." Nazi Germany and fascist Italy sent military forces to aid Franco in the Civil War. Orwell’s Spanish experience shaped his subsequent worldview in many ways. A committed democratic socialist, Orwell had come to Spain to fight against Franco’s fascist forces. On his arrival in Catalonia he found himself in the midst of a social revolution with which he felt an immediate sympathy. In the opening pages of his memoir of Spain, he describes his impression of Barcelona: "It was the first time that I had ever been in a town where the working class was in the saddle. . . . There was much in it that I did not understand, in some ways I did not even like it, but I recognized it immediately as a state of affairs worth fighting for." The revolution Orwell encountered in Barcelona was unique in European history. It had been initiated, in response to the fascist putsch, by the large Spanish anarchist movement (the CNT/FAI), with the support of an independent and anti-Stalinist Marxist party, the POUM (Partido Obrero de Unificacion Marxista), in whose militia both Orwell and Milton had enlisted. It was a revolution organized from the bottom up, with worker and peasant collectives taking direct control of the Catalonian economy. It was also a process independent of the Spanish Communist Party, occurring without direction or support from Moscow. A revolution in marked contrast to the Soviet model, it incurred the deep enmity of Stalin, who moreover at that time was pursuing foreign policy aims that had no place for such an event. In Spain, therefore, Orwell and Milton found themselves in the heat of both battle and a sharp political struggle on the left. Behind the Republican lines, a kind of civil war within the Civil War was taking place, one which pitted anarchist and Marxist revolutionaries against Stalinist elements—including agents of the Comintern and Soviet security forces—who sought to stifle precisely those forces of the Spanish left that were not controlled by Moscow. Stalin was determined to curb the power of the anarchists and to destroy the POUM, which was branded as "Trotskyist." In this, he had an ally in the Spanish republican government, whose own powers had been challenged by the revolutionary movement unleashed in July 1936. In an armed confrontation in Barcelona during May 1937, the pro-Moscow forces emerged strengthened, forcing those who supported the social revolution to abandon their barricades. Anarchist and POUM militants were arrested and, in some cases, assassinated. It was this repression that Orwell describes at the end of Homage to Catalonia, and that solidified the anti-Stalinist views informing later works such as Nineteen Eighty-Four. Harry Milton had been active for a number of years in the American Trotskyist movement by the time he came to Spain. His political experience was therefore considerably greater than Orwell’s, and Milton later claimed that he had helped Orwell to better understand the nature of Stalinism. The Milton collection in the Hoover Institution Archives contains letters Milton exchanged with Trotsky and with prominent American Trotskyists, including Martin Abern. These provide glimpses into the dramatic scenes unfolding in Barcelona in the wake of the May events, with Milton describing the Soviet-organized repression of anarchists and the POUM, including their non-Spanish adherents. He writes to Abern on May 19, 1937: "Every foreigner not a Stalinist is suspect and scores and scores have been arrested." Milton, who had to elude the dragnet of the GPU (Soviet intelligence) when he left Spain, went on to serve with the American army in World War II and stayed active in the Trotskyist movement for a time. Long after his militant period, Harry Milton remained keenly interested in Orwell and the events of the Spanish Civil War. He corresponded with Orwell’s biographer, Peter Stansky; this correspondence, along with other material relating to the Orwell biography, can be found in the Stansky collection in the Hoover Archives. 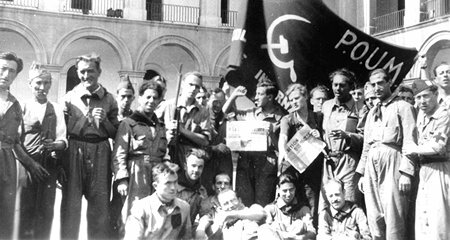 A photo showing international volunteers, probably taken at the POUM barracks in Barcelona where Orwell trained in December 1936, before being sent to the front lines. Some 65 years after its outbreak, the Spanish Civil War continues to interest historians, and a collection of documents from the Soviet archives has recently been published in English (Spain Betrayed: The Soviet Union in the Spanish Civil War, edited by Ronald Radosh et al.). Such documents buttress the arguments made years ago by the historian Burnett Bolloten in his book The Spanish Revolution. A large Bolloten collection on the Spanish Civil War, with extensive materials relating to the events described in Orwell’s memoir, is also housed at the Hoover Archives. Special to the Hoover Digest. Photographs and documents courtesy of the Hoover Institution Archives.